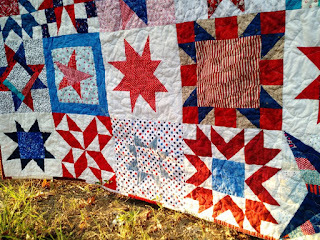 This beautiful star quilt is a tag team effort by Teri from Texas, who pieced it, and Judy from Arizona who quilted it. You might remember Judy and Teri's previous collaborations from here. 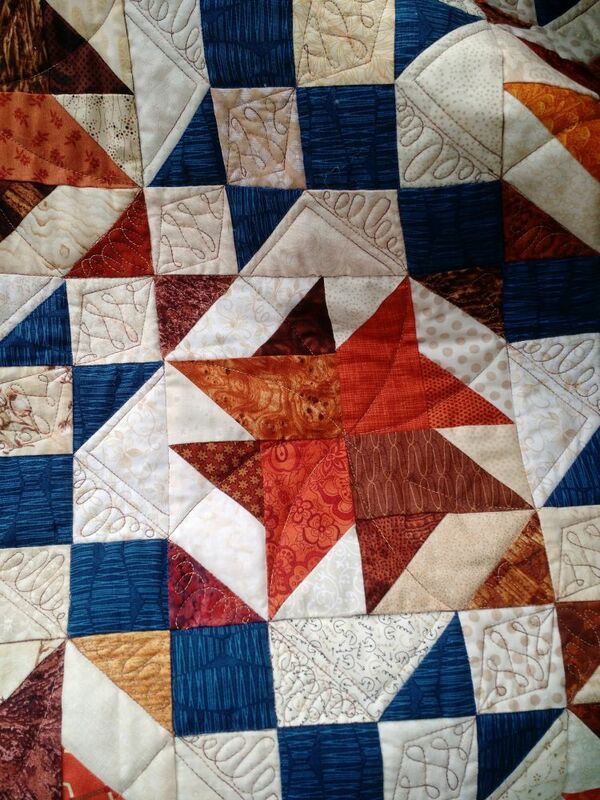 I adore these fall-colored stars with the pretty blue. The neutrals and oranges are scrappy but Teri used the same blue through out the top. 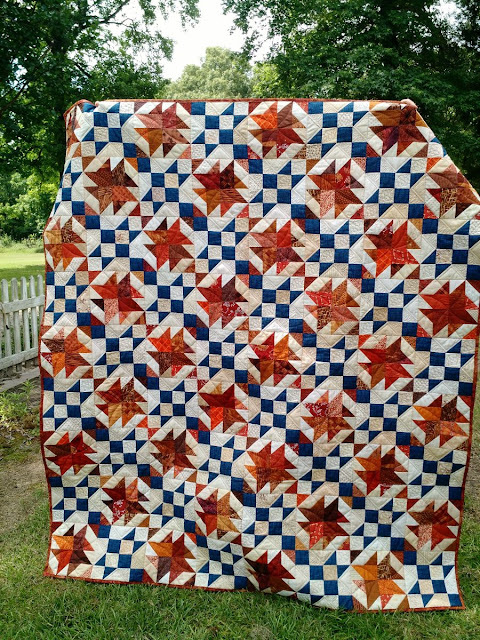 This is a generously sized quilt. I can't remember exactly, but it seems like it was in the 60+" x 70+" range. 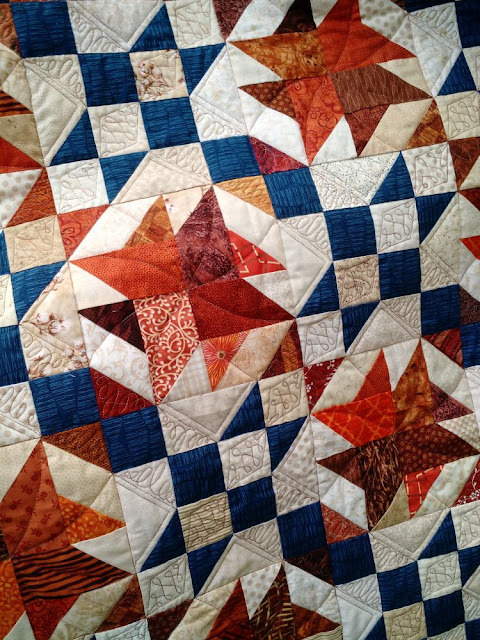 Judy custom quilted it to accentuate the precise piecing. This beautiful quilt will go to a family mourning a loved one through Covered in Love. Covered in Love is nearing 200 quilts given to grieving families, thanks to the support of quilters like Judy and Teri! The new Covered in Love block drive just began and fittingly it's stars as well! This one will run until the end of August if you want to help out. More info here! Wow!! That's a great quilt!! What a beautiful quilt! I love seeing the rusty colored stars for a change. Oh, that's a beauty! I never think to use a true blue with autumn colors, but it works so well. A big thank you to Teri and Judy! 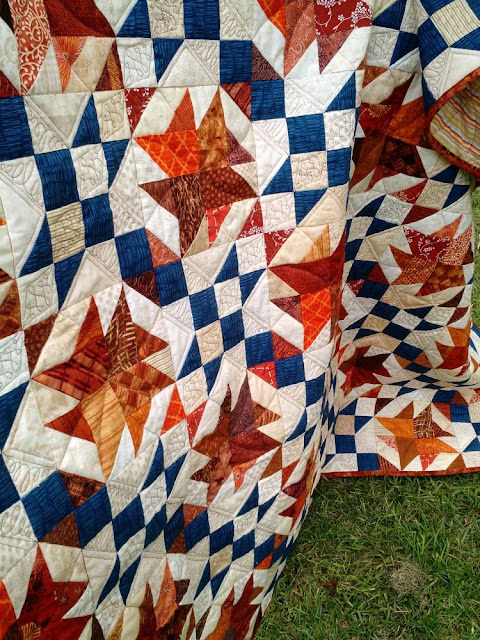 That's a gorgeous quilt. I'm curious about the star pattern also. What is the name of it/where did it come from? I love the fall colors.